We all know what wolves and coyotes look like, and nearly everyone is familiar with bears, deer and turtles; what about some less familiar animals such as capybara, kiwi, or tapirs? There are so many lesser known animals on this planet that we hear little or nothing about most times, it is interesting to investigate a few of these creatures and understand them a little more. Some of the more unusual birds and mammals include a 100 pound rodent, a flower pollinating bear, a mouse that breaths through it’s skin, and a bird that can’t fly. Capybara are first on our list of unusual mammals. 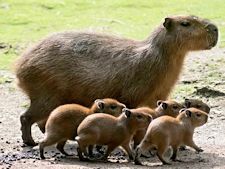 They are the world’s largest rodent, averaging 100 pounds. They are called rodents because they have sharp front teeth that never stop growing. They are semi-aquatic, spending a lot of time in the water. They live in grasslands and forests alongside water in Central and South America. They are most active during the early morning and late evening and rest during the heat of the day. 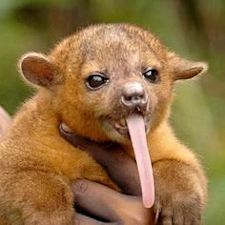 Our next animal is a cute little miniature “bear” called the kinkajou. These are a unique animal in that they are the only mammals that help to pollinate plants. They have very long tongues that they use to lick the nectar inside flowers. While they are licking, they get pollen on their fur and noses and this gets transplanted to other flowers as they feed. They are sometimes called honey bears because they love honey so much, but they are different from regular bears in that they are very small, most times not weighing more than 8 pounds. They are fun loving animals that even make good pets. They feed on fruit, honey and eggs in the wild and their closest cousin is the panda bear of Asia. Another unusual mammal is a tapir. It looks like half anteater, half pig, yet they are not related to either. They descend from primitive horses and rhinos. They come in various color patterns depending on the region they are from. 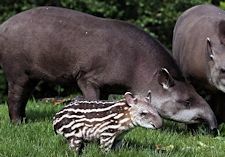 All baby tapirs, however, are born with a pattern of dots and stripes which make them look like a watermelon with legs. As they age, these markings fade away to be replaced with their adult color patterns. 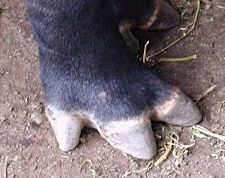 Tapirs have an unusual three toed foot. They feed on fruit, berries and leaves, and can live to be 30 years old. Our last animal is a Marsupial Mouse. While this may seem like just any other mouse, there are some very distinct characteristics about the marsupial mouse that make it stand out. 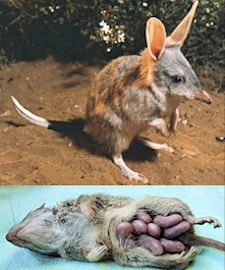 Being a marsupial, its young are “hatched” from inside their mothers and then they crawl through her fir up to their mother’s underside where they attach and feed until they are fully developed. When they come out of their mother, they are so underdeveloped that in order to survive, they have to breathe through their skin. They are the only mammal found that can do this. As their lungs continue to develop, they gradually start to take over the breathing process until eventually, when fully developed, their skin no longer plays a role in breathing. They are carnivorous by nature, eating insects, small birds, reptiles and small mammals. Of the various birds in the world, the kiwi bird is one of the most unique. It is similar to the chicken in that it can’t fly. Their “wings” are only two inches long and for all practical purposes are useless. They are the sole survivor of an ancient order of birds including the now extinct moas. They are semi-nocturnal animals, so catching a glimpse of them in the wild rarely happens. They can only be found in New Zealand and its surrounding islands. The reason they have survived the ages in New Zealand comes from the fact that there are no snakes or large mammals native to New Zealand. A bird the size of a kiwi, without the capability to fly would be an especially attractive target to snakes. Also, the island has no bears, bobcats, tigers, etc., which also makes it easier for the kiwi to survive. 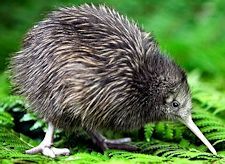 With the coming of humans to the island, especially the colonization by England, house pets such as cats and dogs have become the main predators of the decreasing kiwi population. 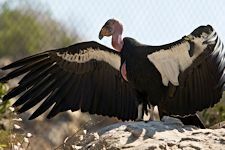 Some of the biggest birds in the world are condors. They can have wingspans up to 11 feet; they use their large wingspan to “float” on air thermals for miles without having to move their wings, which conserves their energy as they look for food. They are in the vulture family, feeding on the remains of animals and thus they play a very significant role in the animal kingdom. They have highly evolved immune systems to ward off infection from the various bacteria left on the animal carcasses they feed on. They are very clean birds, spending much of their time cleaning their feathers and heads after eating to further keep them safe from disease and bacteria. Their heads are featherless allowing them to stay cleaner while eating. The last unusual bird is the worlds smallest, weighing in at only 1.8 grams, which is less than a US penny. 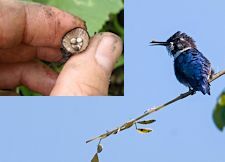 The bee hummingbird makes a nest only 3 cm wide (1.18 inch). Its tiny wings beat 80 times per second. Using all this energy requires them to eat half their body weight in food each day as well as drink eight times their body weight in water. That’s like a 150 pound adult human drinking 144 gallons of water each day. They are found only in Cuba and the Isle of Pines.